The Spartan general Gylippus commanding the Syracusans had been touring the various cities of Sicily soliciting reinforcements. He returned to Syracuse with his recruits and encouraged the Syracusans to try their fortune in a sea battle. When the fleet was ready, Gylippus led out all his infantry by night with the intention of attacking the three Athenian-held forts on Plemmyrium. This was a headland which projected northward to form the southern jaw of the mouth of the Great Harbour. The Athenians had fortified it and had a mooring at its base. The citadel was on the northern promontory which formed the opposite jaw. While Gylippus was marching to the forts, the 35 Syracusan triremes stationed in the harbour were sailing up against the Athenians, while another 45 from the smaller harbour, which was on the seaside of the city, were sailing round to threaten Plemmyrium from the open sea. The Athenians manned 60 ships. They sent 25 into the Great Harbour and 35 to the harbour mouth to deal with the 'outsiders'. Meanwhile the Athenians in Plemmyrium were distracted by the naval battle and were taken off guard by Gylippus, who attacked in the early morning and seized all three forts. The Syracusans did not fare so well at sea. The 'outsiders' forced the Athenians back and then entered the harbour but in an undisciplined manner. Without any order they presented an easy prey to the Athenians, who proceeded to worst both them and the hitherto successful 'insiders'. They sank 11 Syracusan ships and lost 3 of their own. Against that, the loss of the forts was a major disaster because they were used as depots and were full of stores of every kind. In addition, they had provided protection for incoming convoys. In the opinion of Thucydides, this loss was the principal cause of the impending deterioration of the Athenian army. 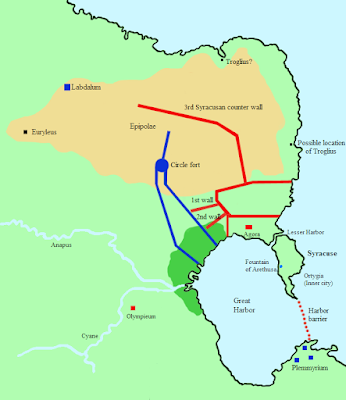 By this time virtually the whole of Sicily, except Acragas [Agrigento], had joined the Syracusans and supplied them with troops. On the Athenian side, Demosthenes and Eurymedon were on their way, also with considerable reinforcements. In the meantime the Syracusans had modified their ships, shortening and strengthening their prows in the same way as the Corinthians had just done (Erineus, above). They were now keen to make a combined land and sea attack before the arrival of the Athenian reinforcements. On the first day of engagement nothing much was achieved. The two armies confronted each other around the walls but did not go into action. On the water, the Athenians put out 75 ships against the Syracusans' 80 but they did no more than spar. On the following day there were no hostilities, but on the third day the Syracusans again went into action by land and sea. Once again the two sides did no more than spar with each other until late in the day, when the Syracusans sent a message to the city officials asking them to bring the market to the harbour with provisions for sale. When the Syracusans backed water to the jetty, they gave the impression that they were retiring from the confrontation. Instead, after a quick meal, they again manned their ships and caught the Athenians unaware and in confusion. When the Athenians rallied and charged the enemy, they were met head on by the reinforced prows of the Syracusan vessels. Even more damage was done by a lot of small Syracusan boats which slipped under the Athenian oars so that missiles could be hurled at the sailors at pointblank range. When the Athenians fled to their anchorage, seven of their ships had been sunk and many had been disabled. The Syracusans had received further reinforcements while the Athenian situation was getting worse every day. They prepared to sail away, but this was prevented by an eclipse of the moon. The soothsayer said that willy-nilly they would have to wait for thrice nine days. The Syracusans were determined to force a naval battle and sailed out with 76 ships. The Athenians opposed them with 86 vessels. Eurymedon, commanding the Athenian right wing, detached his ships and made a wide encircling sweep. The enemy, however, defeated the Athenian centre and then attended to Eurymedon, whom they caught in a narrow bay. He was killed and all his ships were destroyed, after which the rest of the fleet was forced ashore. Gylippus, seeing this, took part of his army to the shore to destroy the crews as they landed. Fortunately for the Athenians, their Etruscan allies also saw this and charged, driving Gylippus' vanguard into the marsh of Lysimeleia. More Syracusans and allies appeared but the Athenians drove them back after a successful engagement. They managed to rescue many of their ships but 18 were captured. The Syracusans were now determined to capture the whole of the huge Athenian force and put an end to their campaign. To this end they blocked up the mouth of the Great Harbour with a line of ships broadside on, barring any escape. 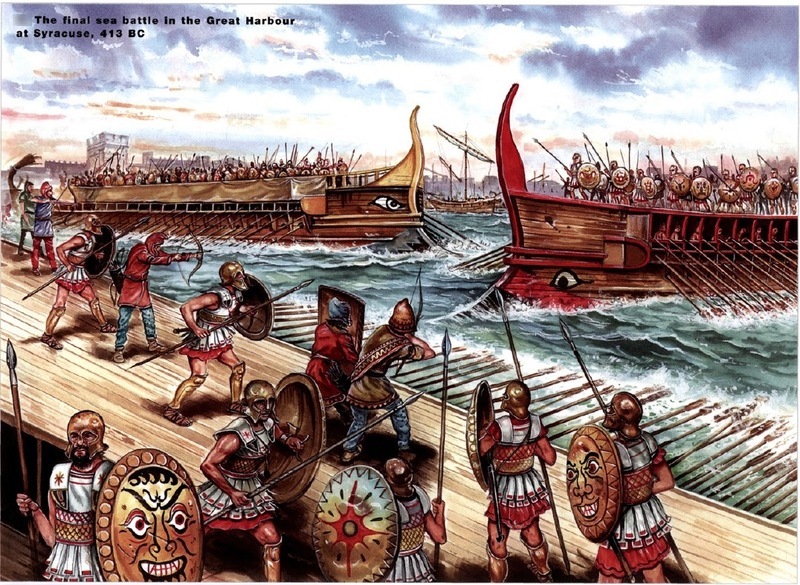 The Athenians decided to put everything they had got into a sea battle and managed to man about 110 ships, with large numbers of archers and javelin throwers on board. Demosthenes and his colleagues embarked and sailed straight for the barrier blocking the mouth. The Syracusans and their allies had already put out with about 75 ships under Gylippus and Pythen. Part of their fleet guarded the barrier; the others were stationed all-round the harbour perimeter ready to attack the enemy from all sides. With a total number of almost 200 ships in the harbour, the ensuing action filled the whole arena. Never before, as Thucydides says, had so many ships fought in such a confined space. It was not a matter of ramming the enemy but of colliding with him and being bumped into at the same time. Consequently, much of the fighting was hand to hand on the decks, amid a bedlam of shouting which made orders inaudible. The action continued for a long while in this vein, but eventually Athenian resistance was broken and they were forced back to the shore. Their ships were abandoned wherever they beached and the crews fled to their camp. 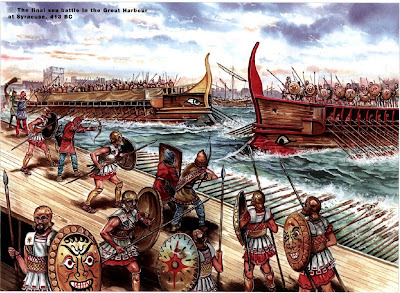 In spite of their defeat the Athenians still had more serviceable ships than the enemy, but the crews were so demoralized that any attempt to make a break-out by sea was out of the question. 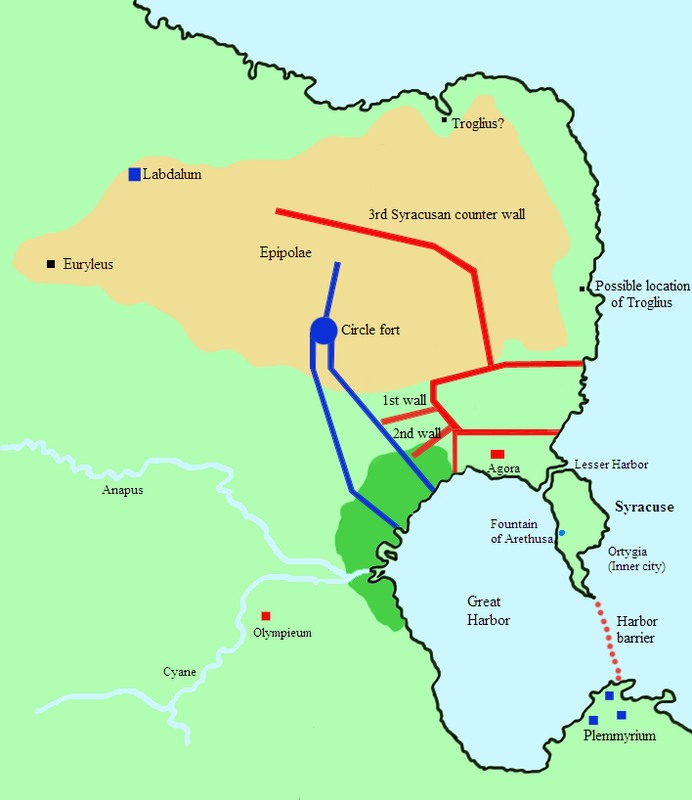 Two days after the disaster the whole Athenian and allied force started to make its way inland, subjected to continual harassment. Nicias and Demosthenes and their respective parties got separated and both surrendered. The two generals were ultimately executed. The Athenian expeditionary force had been destroyed in toto.